2014 is a huge year for SCA student, Jean Canellas. 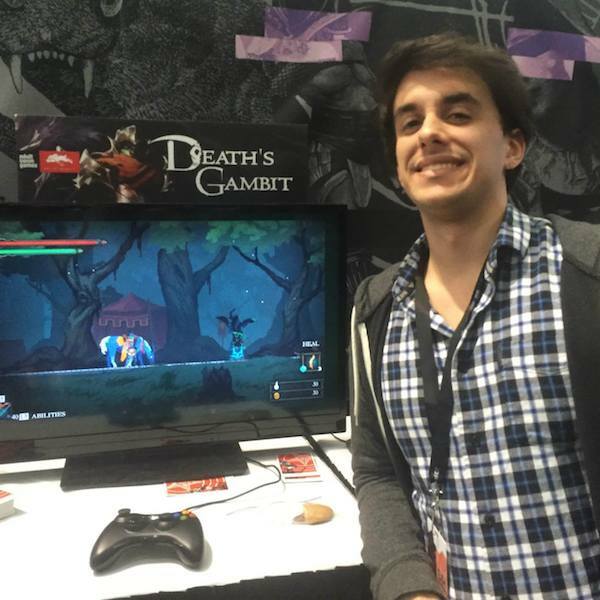 Not only is the IMGD senior graduating in May from the #1 ranked games program in the country, he’s also founded his own production company and signed a development and distribution deal with Adult Swim for his 2D action-RPG, Death’s Gambit. We caught up with Jean during his whirlwind year to talk about his breakthrough in the games industry, his creative and artistic vision for games, and what he’s learned along the way. Tell me about the game. If you had to pitch Death's Gambit right now, what would you say? Death's Gambit is a challenging 2D action-RPG that focuses on big, amazing boss battles –like giant creatures that you must climb –set in an interconnected, nonlinear world. The only thing stopping progression is generally whether you can beat a certain enemy or area. Beating an area’s powerful boss rewards you with newer, better gear and weapons that will help you progress to the next area. Combat involves weapons –usually guns or blades –and abilities. Players can arm themselves with up to three abilities, two weapons, and one healing item simultaneously. The goal is to make the game more about strategy and well planned-play and less about perfect "twitch reflexes" or "muscle memory". What inspired the concept behind Death's Gambit? Were there any influences in particular? We [Jean and his production studio, White Rabbit, co-founded by fellow IMGD student, Alex Kubodera] gathered inspiration from a lot of our favorite stories, games, and movies. It's hard to say one thing in particular. For the gameplay, Death's Gambit, borrows inspiration from Castlevania, Shadow of the Colossus, the "Souls" game series [including Demon's Souls, Dark Souls, and Dark Souls II], MMO raiding, and Spec Ops: The Line. The initial idea for the story was created after I binge watched all of the Ghost in the Shell series. It might seem like a odd inspiration but the philosophy behind the story draws upon several ideas from that series. The world itself is inspired by Studio Ghibli's work [a studio co-founded by acclaimed Japanese animators, Hayao Miyazaki (My Neighbor Totoro, Princess Mononoke, and Spirited Away) and Isao Takahata (Grave of the Fireflies and The Tale of the Princess Kaguya)], Lord of the Rings, and Attack on Titan. There are other story inspirations, but I'll let people figure those out when they play the game. How did the distinctive artistic design of Death's Gambit develop over time? We had ideas of how we wanted the game look, but it took us a while to get the game where it is now –about 3 to 4 months. At the time, we also didn’t have much experience with pixel art, so it took us many attempts to get it to look good. We’re perfectionists, so we kept trying until we got something that stood out. We’re still trying to figure out ways of making it look better! Can you talk a little bit about the game development deal that you have with Adult Swim? Everything really started for us once we posted the first pictures of Death's Gambit on several indie game forums, such as TIGSource. All kinds of people within the games industry, from developers to press, found out about our game from those forums. From there, we got tons of emails from people who wanted to work with us. And we got a lot of emails from publishers looking to fund or publish our game. Initially, our plan was to Kickstart the game and distribute it ourselves, but after seeing so many publishers contact us with outstanding offers, we changed our minds. Once we started getting a lot of attention from the press, we starting pitching our game to other game companies, which was a great experience. Adult Swim Games was one of the many publishers that contacted us. After a long deliberation –many months of discussions with different publishers –we ultimately agreed that the Adult Swim Games deal would work out the best. They’re helping us do all kinds of things that we simply don't have time for, like marketing, PR, and distribution. Adult Swim also found us awesome opportunities and spaces to show off the game, such as big events like PAX [The Penny Arcade Expo] and IGF [The Independent Games Festival]. Back in March, we unveiled our game for the first time at the PAX East event in Boston, and we got a lot of good press from it. How has the festival experience been for you? It has been unreal. That's probably the best word to use. It is still hard to believe. When you work on a game for so long, it’s hard to predict what the audience reaction will be. This was even more amplified by the fact that this was our first real game –we had never made anything like this before. 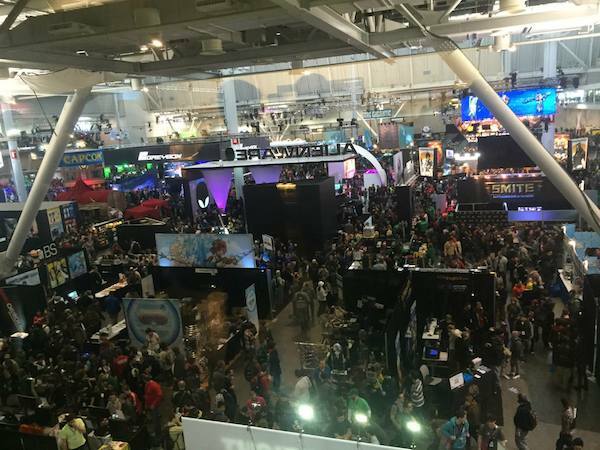 These events, especially PAX east, got us a lot of media attention. Looking back on it, we initially didn't want to show the game because we didn’t think it was ready yet, but it worked out in the end. From going to events we learned more about what people expected from the game, and we were also really happy to find out that the audience we are going for really liked it! Is there anything you've learned throughout this process that you'd like to share with other students? I could definitely say a lot about this topic, but I'll keep it simple. What have I learned about the process? Making games is extremely hard and time consuming. It’s definitely the most challenging thing that I've ever done. For other game design students out there, I highly recommend getting a game programming minor. I personally HATE programming, but I stuck through with it, and it has helped me get to where I am today. If you are a designer and you want to see your exact vision become a reality, becoming a good programmer and learning that skillset can only help. A programming background will also open doors once you start looking for game design jobs. One thing that I learned about the IMGD program is that you need to be very proactive to get the most out of it. If you don't put the time into making games, you will graduate without a good portfolio. You must put as much time as possible into making games and building a strong body of work. Also, in terms of promoting your own indie game, we learned early on that many of the big press sites, as well as smaller media outlets, look at indie game forums like TIGSource for new games to cover. I would recommend keeping a devlog on indie game forums like TIGSource. You should also email small indie game press sites for coverage and publicity. Your game will have an easier time getting covered by smaller sites. Where can people get a chance to play your game or learn more about it? Death's Gambit is still early in development! We have not announced a release date yet. That being said, you can follow the development by checking out our website at www.deathsgambit.com and our weekly development blog http://deathsgambit.tumblr.com/.